The Gratitude Project is all about being grateful for the good things and the good people that are part of our lives. I am grateful for the wonderful people who realise that there is more to be gained by saying "Thank You". 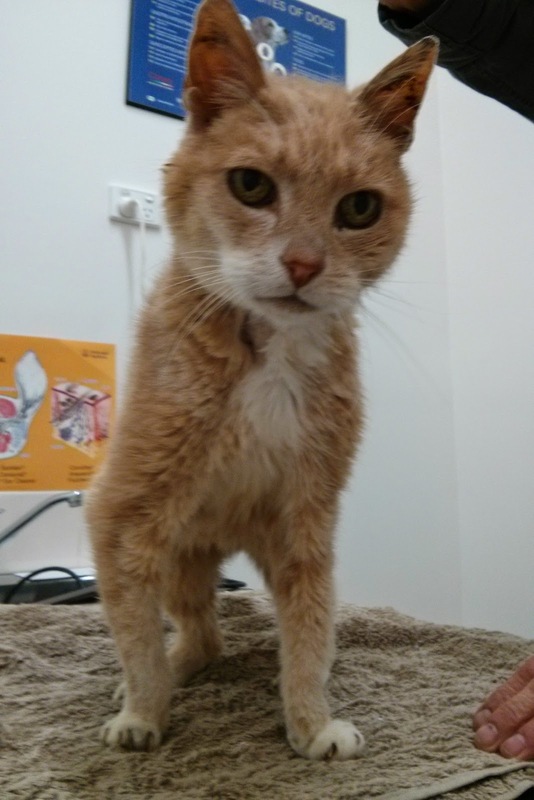 @theonlypandora is the twitter handle of Russell Vale Animal Clinic, named after the boss of the vets, Pandora. How many of you spend your day thanking others? Most of us don't as we often assume they know, or we say "well that is their job". Please, stop and say "Thank you" to your bus driver, to your shop assistant, wave a thanks to the person who holds that "Stop/Go" sign at the roadworks. I am Dr Liz, the mad vet from Russell Vale Animal Clinic. Whilst I own and work at Russell Vale vets, the true boss is Pandora (pictured), and all of the beautiful animals that we see every day. Thank you for allowing me to continue doing what I love doing - helping our beautiful animals - whether it be keeping them healthy, helping them get back to being healthy, or to give them dignity in their final moments. Why I hate pre-anaesthetic blood tests in our pets! 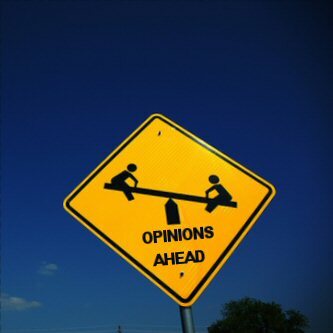 Be prepared - opinion ahead with a wee bit of tongue in cheek too! There is a huge problem that can arise when we start doing pre-anaesthetic blood tests in our pets. Just for those who don't know, doing a blood test on a pet prior to them having an anaesthetic is now a common place procedure. In the olden days, however, the majority of pets would be lucky to get a haematocrit (to look for anemia), and a BUN (blood urea nitrogen) as a kidney screen. These days, our pre-anaesthetic panels include the haematocrit, but also a urine sample (checking concentration, sugar, protein, bilirubin, and blood), and an assessment of six parameters (glucose, urea, creatinine, total protein, ALT and Alkphos). In some of the older dogs/cats, I even upgrade at no extra charge to measuring 12 parameters. In the olden days, the majority of pets undergoing surgeries would not get any blood work done, or rarely. Rarely would they go onto intravenous fluids for extra support. The majority of animals did OK during the anaesthetic, with many being a bit off for a few days after wards - but it was always blamed on the surgery anyway. In fact, it was almost expected that the dog desexing would not move for 5 days! These days, that would be unheard off! In those days, if the dog died a few days afterwards, well, everyone just blamed the vet and the surgery. When they drive past the vet hospital, they would shout out to their friends - "That's the vet that killed my dog!" I have never had that happen to me, but I know it has happened to colleagues. But again, in those days, they were "just a dog" or " just a cat", anyway. It was easy enough to go down to the pet shop to pick up another pet for $50, or a free one from the pound or from your neighbour's dog who just had a litter. "Am I so easily replaced? Methinks not!" Are there veterinary hospitals still like this out there? Yup - some of them even have their own TV show in the US! Sad, but true! Vet fees were also cheaper in those days too, and for a good reason. There was no fancy equipment, licensing or or facilities needed to have a vet hospital, not like now. The only fancy equipment that the vet hospital needed was an Xray machine, which wasn't used most of the time anyway, as it was too clunky and cumbersome to use, and the radiation exposure to us, well, radiation tags was not standard either! It wasn't even a requirement for there to be a gaseous anaesthetic machine. You just needed to pay a licence fee, and that was it... you could call yourself a vet hospital. These days, you need to pass alot of very expensive council requirements on noise, location, facilities, and the Vet Board also is pretty strict too - from things as minor as sinks in consult rooms, to fully equipped isolation rooms (although they are rarely used or needed these days). Give me the good old days! (not... standards are there for a reason!). 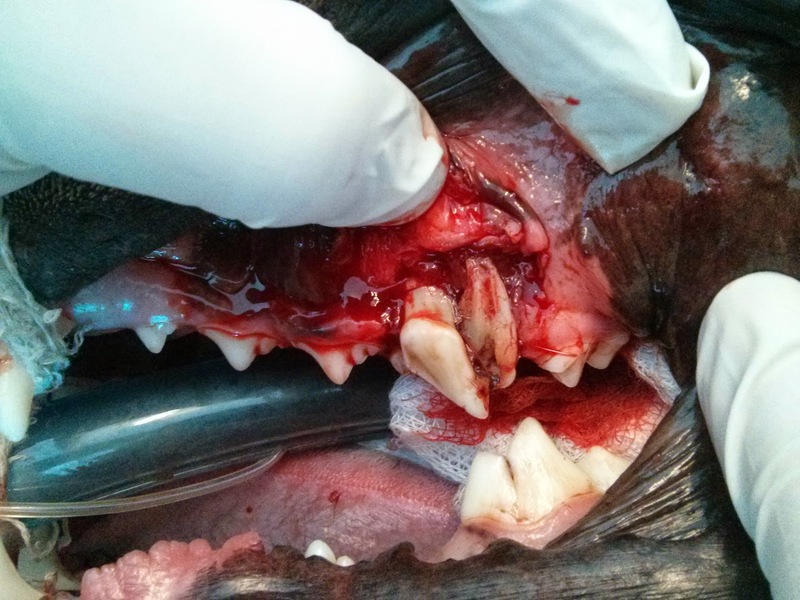 So why would I hate pre-anaesthetic blood testing in our pets? And why does doing them cause so many problems? In the assumption of all being OK, in the good old days, we we were able to knuckle down and tackle any and all procedures that needed doing. No mucking around, we were able to knock over 10 or 15 or even more surgeries in a couple of hours. These days, with this new fangled blood testing, from taking of the blood sample, to running it through the expensive biochemistry analyser, takes precious time, skill, and money (to purchase the equipment). And then, if we identify a problem, then it puts a halt onto everything that was planned for the day. We have to get onto the phone to talk to the owner, and give them the news that no pet owner wants to hear "We found something wrong in Muffy's blood test today, and this is what we need to do now". Frankly, owners do not want to know of problems, they just want solutions! (- I know most of you want your pet to be happy, and you are as devastated as I when you know there is a problem). Do you realise how many dental procedures I had to delay to sort out why the liver enzymes were elevated or to manage a kidney infection? Do you know how many desexings in otherwise "healthy" six month old dogs couldn't be done all because the blood tests indicated a problem. In some cases, they turned out to have congenital liver disease (such as a portosystemic shunt, and in others, the dog had a toxic treat two days previously that caused liver damage. All of these problems unrelated to the surgery that was planned, but without identifying them, the pet could've died, and it would all have been the vets fault. Talk about frustration for me! I am psyched up to remove ovaries and testicles, get those teeth cleaned up, and remove the infected ones! And now, I can't! All dressed up for surgery - well, Miss Piggy is. On a serious note - I do not hate pre-anaesthetic blood tests at all - I actually adore and love them. Thanks to these all important blood tests in a "healthy" dog or cat, that we have been able to show that they have not been as healthy as all appeared. We have been able to treat those diseases successfully, and plan for their future anaesthetics, guaranteeing a survival for many many more years! Instead of the compensatory renal disease dog collapsing due to renal failure two days after the anaesthetic, we are able to prepare the patient with fluids, monitor their blood pressure throughout, ensuring a problem free anaesthetic, recovery and prolonged survival. Phew... helping pets live happy and healthy lives is what drives me, and, I have no doubt, all of my fellow veterinarians. We just want to be there for you and your loved family pet, so thank you for allowing all of us to continue doing what we love doing. Identifying and treating disease is what I do best! I am Dr Liz, the mad vet from Bellambi. We are here for happy, healthy pets, always! It is only when a pet goes missing, that a pet owner's eyes is opened to the devastation and loss of what many others have gone through, and are still going through. 5. feel guilty for doing none of the above. The reason why they never got it done is usually because they all assumed that their pet would never escape or run away. 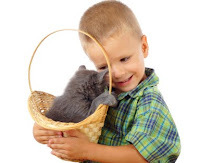 Our kids love our pets so much - for them, do the right thing by your pet. Sadly, we are dealing with animals, that no matter how much we love and they love us, will still find themselves alone and away from home at some point in their life. And the only way they are going to get home is either through their tag, their microchip or through the age old method of pounding the streets and sharing photographs/posters/social media. 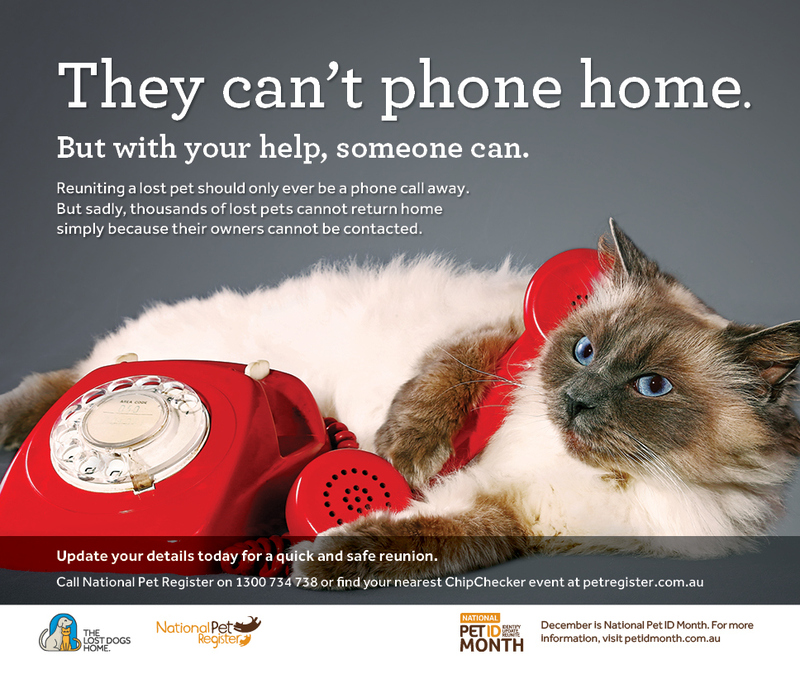 In NSW it is compulsory for all dogs and cats to be microchipped - whether they ever go outside of the house or not! Sadly, as a vet, I am seeing too many stray cats unmicrochipped all because of this mistaken belief. Equally sadly, I am seeing too many stray dogs who are unmicrochipped, which sets up a dilemma for all of those who work tirelessly in getting lost pets back home. The Companion Animal Act is very clear in that all animals must be taken to the local council pound. Microchipping is cheap, getting your pet home again ..... priceless! Most often, this is the best place for pets to be reunited with their family. The sad reality is, the fines and fees can mean many owners elect not to get their pet. Now onto a common fear of owners of lost pets - has the microchip moved, or perhaps is no longer functional? They ask the question "is it possible"? The answer is "Yes", but it is an easy fear to solve. 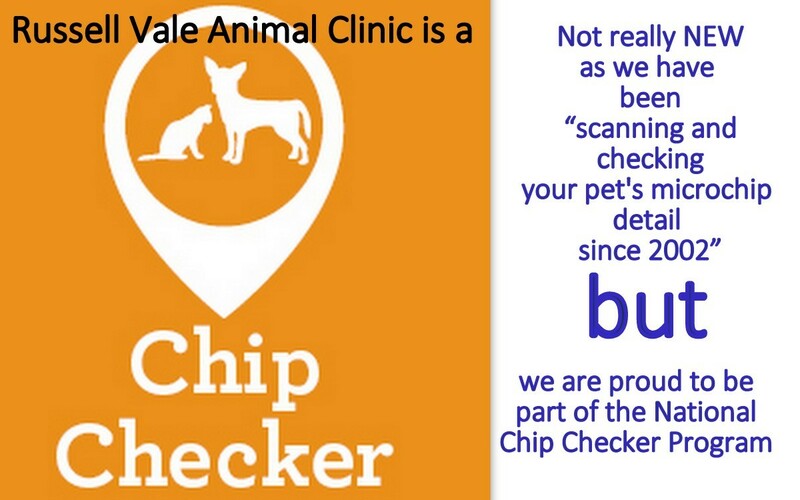 You should be taking your pet to the vet at least two to three times a year anyway, so this is a perfect opportunity for your pet to have their microchip scanned and checked. 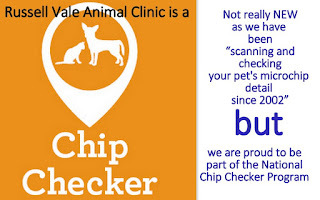 Russell Vale Animal Clinic is an Accredited Microchip Centre with the Australian Veterinary Association, AND and Authorised Microchip Identifier with the NSW Government, so we, like many other veterinarians equally accredited and authorised are there, willing and able to help you and your pets. Just in case you were hung up on the multiple vet visits? You should be visiting us for your pet's Annual Vet Check, as well as their six monthly dental check, and their arthritis check (at the very least). We have been checking our pet's microchips for over ten years now, which always includes checking the information on the databases. One of our very "soapbox" points is the accuracy of the information on the microchip databases, as well as the recoding of "Alternate Contact" details - which should be someone who is a friend or relative that doesn't go away on holidays with you, and that is easily contactable (oh, and it helps if they are not one to change addresses or phone numbers). What about the use of technology? There are many pet apps out there, but we use and recommend PocketVet. The links to that are here. You can keep up to date photos of your pet in there, and if your pet goes missing, it will send notifications to all local users who also have the PocketVet app on their phones. There are many lost and found pet services out there, including social media, so go here to get that list. What about something as simple as a tag on your pet's collar? That is easy to do, and makes things so much simpler for everyone. And in NSW, it is compulsory for all dogs to have a collar and tag. Don't let the disappearance of your pet fill you with the regrets of all of the things you should've done. Act now. I am part of many of the local and national "lost pet" pages, and all too frequently, when there is a pet that is found, someone will always say "I'll take it". 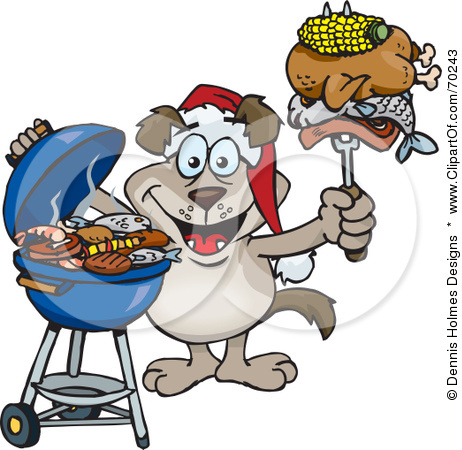 We have also come across situations of people who, even with the best, generous intentions, take in a lost pet, feed, house, clean it etc, and take on the responsibilities of a pet owner, but fail to take the first most important step - to take it to a vet to be scanned for a chip, or to take all measures to find the owners. 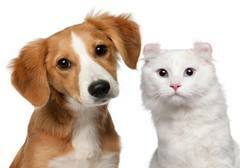 Never assume that because the dog or cat is in poor condition, that the previous owner did not love it or care for it. 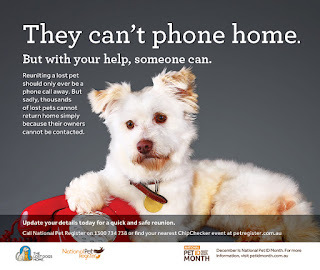 There are many pets who have been missing for a week will lose a dramatic amount of weight, and if you have been missing for months to years, it would not be hard for a maltese terrier's coat to not get matted, or for the flea numbers to build up. You have to realise that every stray pet has an owner. How would you feel if your pet went missing, and someone else found it months later in a poor state, and made no attempts to find out who the owner was all because of how it looked. You would be devastated! So don't do it to someone else. To make it easy for you, here is your "Action List"
1. Get a decent photo of your pet. 2. Download a pet care app on your phone. 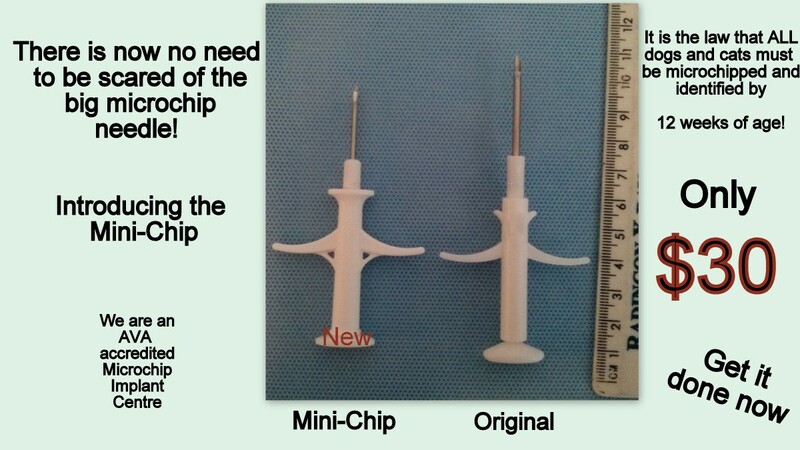 We recommend and use PocketVet. Links are here. Add your pet's details and of course, a gorgeous photo of them. 4. 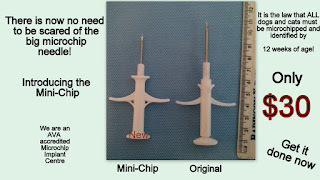 Ask your vet to check the databases for your pet's microchip details. 5. Check your pet's tag - is it up to date, can you read the numbers - if not, get a new one NOW! 6. For a free tag, visit here. Once you have done all that, pat yourself on the back for a job well done! A good photo of "Ol George" (RIP) a Stray who stayed! Finally, if you choose to have a pet as part of your family, they are never going to be free. They will cost you money, and sometimes, more money than you may be prepared to spend on them. If you are never going to be willing or able to do that, then do not blame others for the fees/fines that are charged. Its not their fault that you have failed to take your pet ownership responsibility seriously. All of us at Russell Vale Animal Clinic thank you, the loving pet owner, and all of those animal lovers out there who go out of their way to rescue dogs and cats who are found wandering the streets, wanting to get back home. I am Dr Liz, the mad vet from Bellambi Lane. I look after the dogs and cats. We are located in the northern suburbs of Wollongong, in Russell Vale, on the beach side of Bellambi Lane off Memorial Drive. Any questions, do not hesitate to contact me via email or call us on 02 42845988.